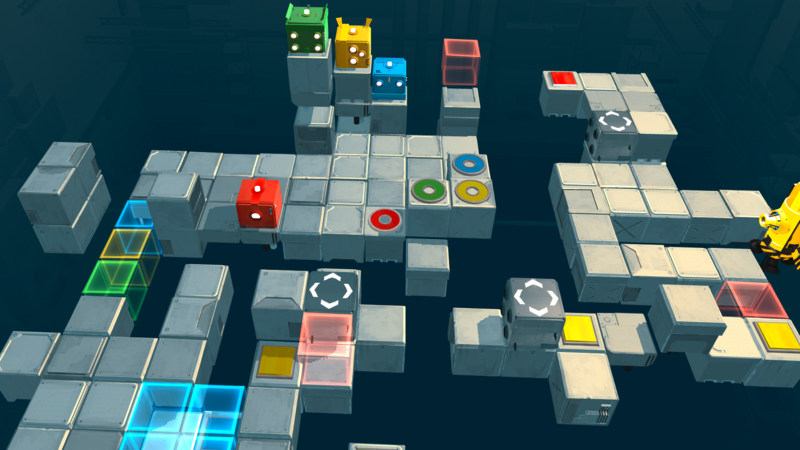 Death Squared is a charming puzzle game for one to four players. The game is developed by SMG Studio, based out of Sydney, Australia who have a pedigree focused on tight indie experiences. 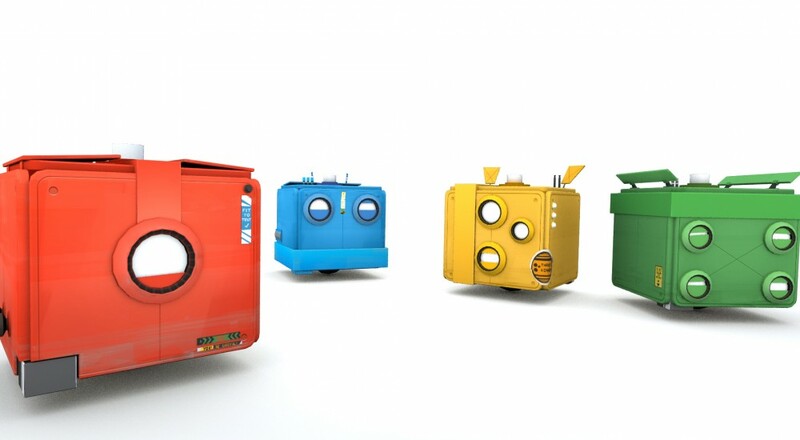 Their games are charming and colorful, and Death Squared fits right in with their style. 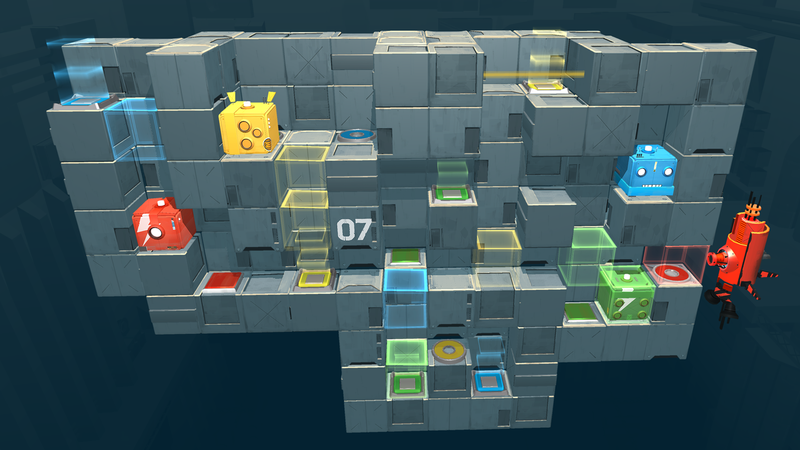 The goal of the game is simple: navigate a robot cube through a test chamber to its matching circle color on the other side. Sounds pretty easy. What makes this idea interesting is the setting SMG has built around each of these test chambers. Each of the levels are filled with various traps, platforms, lasers, and barriers preventing access to the desired circle. This plethora of hazards start small and build as levels are completed. Players are forced to learn each new ruleset waiting for them in subsequent test chambers. The hook is this Death Squared can be played single player, but it is designed to be played with friends; who have to co-operate, communicate, and think together. This is one of the few times a puzzle game has put co-op first and it can be seen in the level design. These chambers are meant to be tested with others, where solutions come from things like transporting each other across gaps, button presses to keep traps at bay, or physically blocking a laser with a cube to prevent friends’ cubes from exploding. I played a handful of levels on my own, but the game shines when sitting on a couch with a significant other, friends (3), or posse (4). The test chambers are intricately designed and the build up in difficulty allows for a natural level of progression. 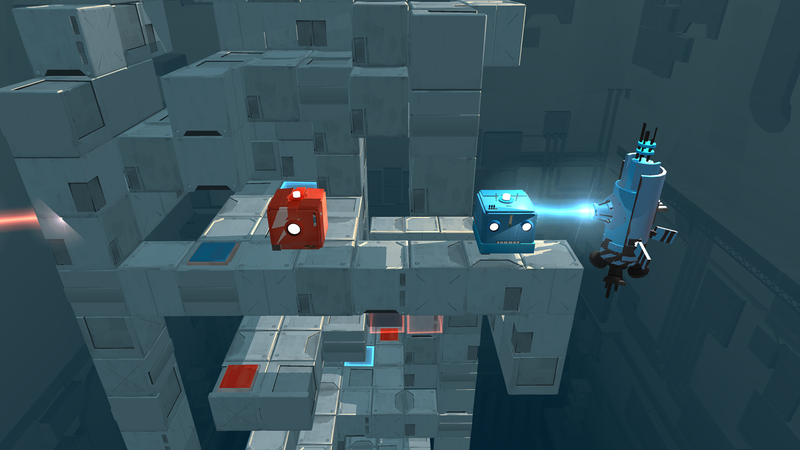 The standout effort from SMG is the world they have created for Death Squared. The writing and aesthetic design choices feed directly into the gameplay and tie the whole package together. I think it would be a lesser game if there were no characters involved and the art style was an afterthought; especially in a genre where gameplay usually trumps aesthetics. The setup for the game has two characters. David, a subject in a robotics testing facility who is tasked with running the robot cubes through the different chambers. His companion, IRIS the facility AI who manages the tests and is devoid of all emotion. The dialogue between David and IRIS was on point throughout my entire experience. 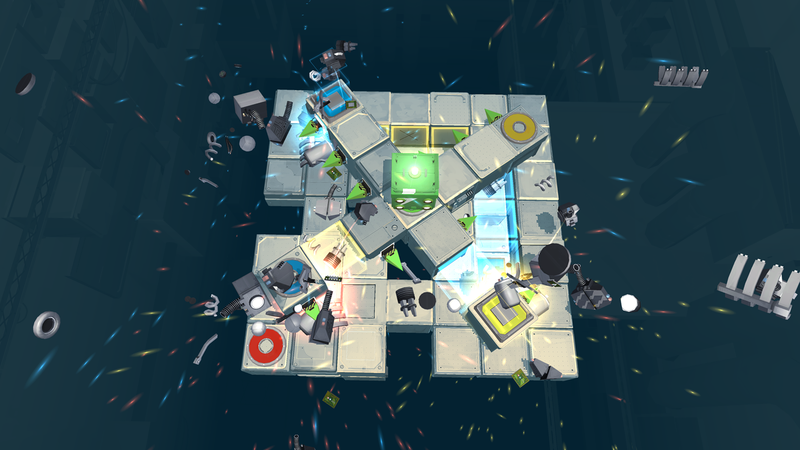 Each level has something different to say and perfectly timed quips for when the robot cubes ultimately get destroyed. I honestly don’t think I heard the same line twice and I died a lot. We’re talking double digits for some of the tougher levels. What I find unique is death is the learning mechanism. I’m used to this in something like Dark Souls, but not a puzzle game of this nature. Each time our group of cubes falls to its death off the side of the platform, we learned something. Do we have to communicate better, work on our timing, or did someone just completely screw up. The deaths don’t feel cumbersome and never become a point of contention because the narrative is there to ease the pain through witty dialogue about how we could have corrected our mistake. It never got old and we laughed multiple times during our play sessions; especially since we began to feel bad about our robot cubes meeting their demise too many times. Death Squared feels like a social experiment. It has been championed as a game to play with ‘non-gamers’, which I can appreciate but I think it sells itself short. The simplicity of the game is what makes it accessible to all, but what closes the gap between experienced gamers and people who rarely hold a controller is that communication is king. Cooperation through thinking and talking together to work out these puzzles is the design choice which makes Death Squared enjoyable to anyone. Like any group activity, the experience entirely depends on the dynamics of the team; where the game at hand merely acts as a vessel. The game is simple, and therein lies the reason why anyone can pick it up and play. It is simple in three aspects: visuals, ruleset, and controls. Controls are self explanatory as to why they dictate accessibility. Simple controls means no one is struggling with how to do something. Death Squared has one control that matters - the analog stick to move your cube. The rest is for vanity. Next is the ruleset which builds on itself with each level. The game becomes more difficult but the goal of the game never changes; move the cubes to their matching colored circle. The challenge and fun comes from the new rules which come from each subsequent level that change how you play the game. For example, when lasers are introduced for the first time, everyone quickly finds out how lasers work after the first time it blows up a robot cube. The simplicity of the visuals allow players to pick up on the rules very quickly. Color is both an important visual cue, and gameplay design choice. Puzzles are usually solved through interactions between the two to four colored cubes and corresponding colors in each test chamber. I’m being vague here because I want people to experience these discoveries on their own. I can’t stress enough how well the sterile test chamber environment works here, and I can’t fault SMG here for plucking a couple ideas from the Portal design playbook. The visual design not only looks great, but is intrinsic to how the game communicates to players and then players communicating with each other to solve each room. The rules are there, and the visuals allow the players to pick up on new rulesets very quickly, making it accessible to anyone who delves into the test chambers together. I applaud Death Squared for valuing design and putting as much thought into their visuals, writing, as they did for gameplay and environment creation. I played through the ‘story mode’ (read: 2 players) with a buddy in an entire evening. I play a ton of games, and he dabbles but we were on the same level in Death Squared. When I played with a group of four, I had prior knowledge then the new players, but I was still at the same disadvantage since solutions come through teamwork, and not just knowing how the puzzles work. Pick this up and play it with your significant other, family, or any group of friends who want to have a great evening. Even if you have completed the puzzles, it still requires communication and every group is going to be different. Don’t be a tour guide and take joy in the experience emanating off the people playing for the first time. Laugh together and die together. Death comes quick and often, but the lack of load times makes for a seamless experience. Death Squared is SMG Studio’s best achievement to date and they should be proud. This is a trust exercise for your brain, and ultimately your relationships. Go enjoy. 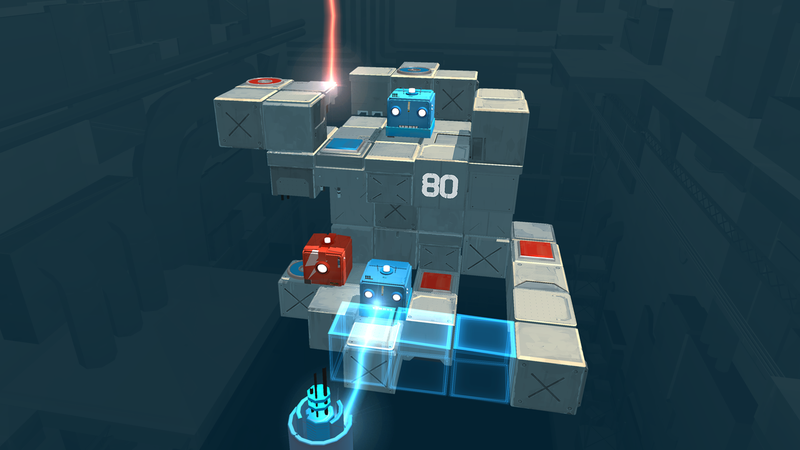 Death Squared was reviewed using a digital copy of the PC version of the game provided by the developer. The Co-Op Experience: Play the core story in 2-player co-op, or play through a series of increasingly difficult rooms in 4-player co-op mode. Page created in 0.5738 seconds.